Re Coors question from before, I don't have any evidence either, but seems to me were I GMing a team that plays half its games in Coors, with regard to run prevention to would want a) sure handed infielders and fast outfielders, because extra outs will kill you there faster than anywhere else; b) strikeout pitchers, preferably those who can do so without a breaking ball (fastball changeup or fastball splitter pitchers would probably be best, i.e. Ubaldo Jimenez or Hideo Nomo); c) extreme ground ball pitchers would be OK too, but those are few and far between. Well, not to be argumentative, but if you were studying the issue you would want to study it with a clean slate. It's fine to study it asking "are ground ball pitchers more effective here than in other parks (relative to the peculiar norms of the park)" or "is speed in the outfield more valuable here than in other parks?" But it is a different thing, and it is destructive, to begin with a position on what should be most effective in Coors Field, and then study to see whether that is true. To do the latter biases the study toward the conclusion that those things work in Coors Field, and I don't have any basis to believe that that is true. But if he's saying "another" thing ... in Science, the process of setting a "hypothesis" like --- > "is speed in the outfield more valuable here than in other parks?" that first hypothesis should be one you think has a good chance of being right. Your 1st hypothesis should not be "are there sprites under mushrooms. It is a guess, and it should be your BEST guess as to what might be true. 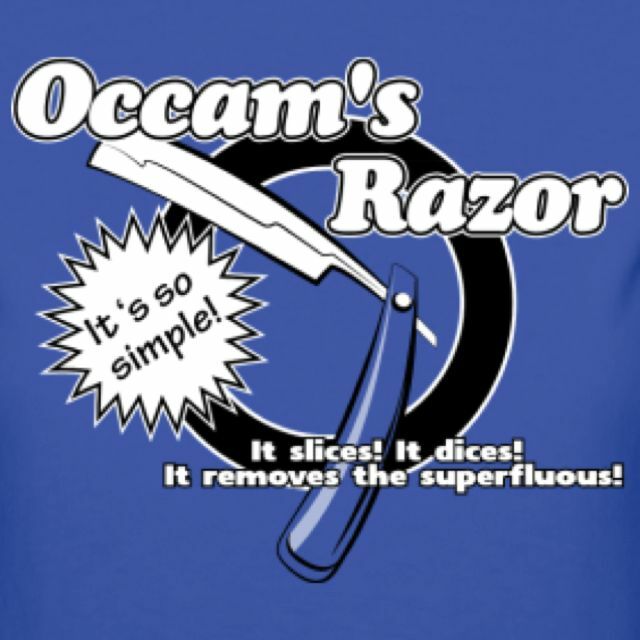 Actually Occam's Razor helps you only to FIND A HYPOTHESIS. It is then that the Scientific Method BEGINS, that the process of inquiry, investigation and testing must start. We don't get to set a better hypothesis and then say, "DONE!" You'd be surprised how much this single light bulb helps your whole life. MOST scientists do not comprehend the previous. And by "most" I mean 90-95% of people with Ph.D's or M.D. 's in hard sciences don't get that. I've got a hypothesis that Seattle 2018's "Merry Band of Adventurers" has chemistry that helps them on the field. It's my best guess, but it's too complex a system to study. I must be misunderstanding you - 90-95 percent of scientists don't understand the scientific method????? C'mon. I'd be surprised if even the reverse were true, that 5-10 percent didn't understand. What do you think people in science labs do all day - and frequently all night? They form and test hypotheses. I know a guy who's been testing and refining a single hypothesis since 1973! I spent three years in neuroscience labs in the earlier oughts and met 100s of scientists. Not a single one didn't understand the scientific method. (NB: The resulting book, 101 Theory Drive, is a wonderful introduction (says he!) to the science of learning and memory and makes an excellent gift for old people scared to death of losing theirs. In fact, email me - tjm99@msn.com - a physical address and I'll send you a copy. Not being a scientist, I'm going to stay away from the "90-95% of scientists" debate--although tjm seems right to me. However, on the overriding issue of the M's chemistry--I think the test is just ahead of us. Two, actually. --Fourtunately for us, the guy coming back says he'll do whatever it takes to help the team. So Cano is not claiming the spot is his. Which leaves the question, what to do with him? The idea that he 'moves around'--a little first base platoon, a little DH, whatever...is crazy to me. His bat must be in the lineup EVERY DAY. We are last in our division in runs scored, and we have to do something about that to come close to realizing the powerful lineup we all hoped for. --As soon as he's ready (and he better be working on tnis privately in the DR as we speak), he needs to learn first base. I can't think that will be an overwhelming challenge from a tallent standpoint--just learning the ins and outs of the position. Then, hello Ryon Healy, backup first base, third base and RH pinch hitter. This is the only thing that makes sense. OK, on to test #2. --at this point, I don't think even Felix, despite his incredible career of carrying an entire franchise on his shoulders, expects to start a one-game wild card showdown. That would be penalizing the team and the fan base. --But--what happens if we make it through to the next stage...or even start there as the division winner? Does Felix get one of the starts....for old time's sake, even if we've got someone better to put in there? I'm in the camp that says winning makes good chemistry, not the other way around. I've never heard of a really happy group of 'brothers' that loses more games than it wins. So I say the test of good chemistry is yet to come...in how JD and Servais manage these two tests. Does Cano get 'punished' even if it hurts the team? Does Felix get rewarded, even if it hurts the team? Neither one an easy call in the clubhouse, I'm guessing. King Felix is still "The King" in big games. Look what he did when the M's were in NY and Boston. I don't think I'd be afraid to let him pitch in the post season. If he's healthy he may be our best big game pitcher. Just my .02 from the cheap seats. ...N'Kisi is available to set up near the batter's box in Safeco and send updates on hitter's thinking to Felix during his starts?